Whether for your curriculum, a replacement or if you simply wish to get better math grades, getting a performant graphing calculator is the best course of action. These devices can help you visualize complex math concepts in a multitude of subjects, pretty much anywhere graphs need to be created. For an optimized study process, this is definitely an essential tool. Check out our other articles about the best whiteboards and best electric pencil sharpeners. This article should cut short your research time as it provides you with the best graphing calculators for the money. It may not be a huge investment but it’s still important to make the right choice and get the device that can help you the most in your learning endeavors. The most important criteria after which this selection has been made was if the product is worth the money. They may be different in terms of features and prices but the one thing these graphing calculators have in common is that they are all extremely good investments. 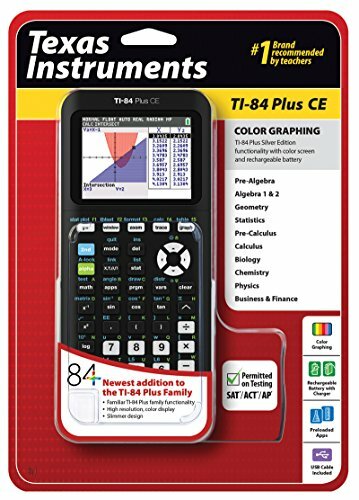 The Texas Instruments TI-84 builds on the highly popular TI-83 Plus graphing calculator and comes with better performance, more memory, an enhanced display with a stronger contrast, and brings more beloved apps. It’s an all-purpose graphing calculator perfect for tackling math and science problems. 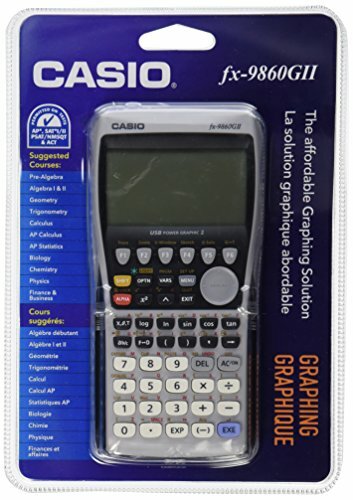 With such a great price, it is a very cost-effective solution if you need a graphing calculator. The TI-84 makes use of the MathPrint technology that creates a more engaging experience for students allowing them to enter fractions and equations using the proper notation. In this way, they can see it displayed a like it’s printed in texts. Speaking of tests, this graphing calculator is approved by standardized testing organizations to be used in many college entrance exams. A multi-functional educational tool, it offers an LCD display generously sized which can show many plotted graphs and equations. Among the included apps we can count the Conic Graphing, Polynomial Root Finder, and Vernier EasyData. Viewing an equation with its graph and the coordinates all at the same time is possible and the calculator includes many helpful functions for statistics like regression, graphical, and data analysis. As the calculator is not a particularly simple device to learn, especially for inexperienced users, Texas Instruments provides many useful resources and reliable access to technical services representatives. Able to handle virtually everything you throw at it, the Texas Instruments TI-84 has the potential to be your ideal companion for a better learning and understanding of difficult mathematical concepts. Most people who tried it can swear they wouldn’t have passed some classes without this handy calculator. Being equipped with so many rich features, this graphing calculator is your safest bet at this price level. Ready to go right out of the box, the Casio fx-9750GII brings a lot of value to the table for a graphing calculator. It has a generous operating memory, USB connectivity, and AP features providing a useful package in the hands of any student. For those not willing to spend too much money on this kind of tool, it seems like the best choice currently found on the market. One of the most important aspects about this graphing calculator is the user-oriented hardware design. Casio understands that in any classroom setting you need an intuitive user interface that students can master quickly and efficiently. To enhance student comprehension, it comes with a high-resolution LCD display featuring enlarged dot-area technology. This helps a lot with the sharpness of the image and stuff like formulas, graphics or statistical data are more clearly represented. The CPU is another area where the fx-9750GII doesn’t fall short. It can make accurate and swift calculations and the 62KB RAM is sufficient for lengthy calculations and complex graphics. It may lack the performance of the more expensive models, but for general usage, this model is surprisingly reliable. 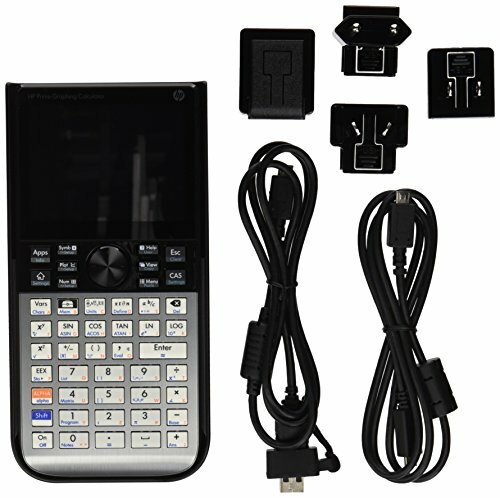 The USB connectivity allows for convenient data sharing with other calculators. You can also connect it to a PC, though the Program Link software has to be purchased separately. The Casio is permitted for use on many college entrance exams and AP tests. There may be stuff this graphing calculator can’t-do, but if you want to cover a reasonably ample set of problems, this device could be a suitable choice. For those wishing to save some money, it is one of the best graphing calculators. Considering the decent CPU, the software features, the high-resolution LCD, and most importantly the intuitive user interface, this purchase is a no-brainer. 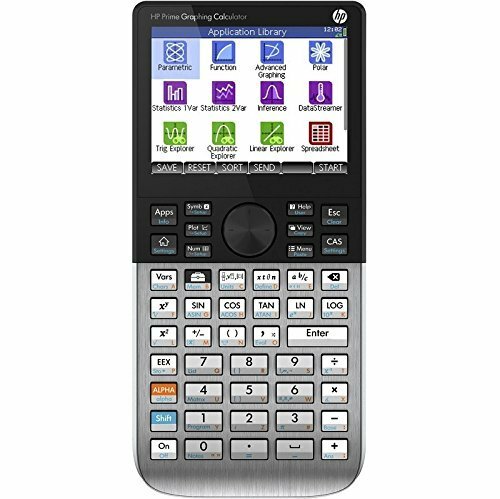 In case you wish for a more modern approach to graphing calculators, the HP Prime v2 is one of the most solid tools on the market. It boasts a full-color touchscreen and keypad interaction as well as formative assessment tools and intuitive math applications. To complete the attractive package, HP added a long-life rechargeable battery to this device capable of performing many complex tasks. HP implemented a vast array of applications in such a small package. Besides spreadsheet applications, you gain access to Dynamic Geometry, CAS, and Advanced Graphing. To switch with ease between symbolic, graphical, and numerical table views, the Prime v2 offers dedicated buttons. The calculator has a very slim design, the brushed metal giving off a certain premium feel. To protect the device when not in use, HP includes in the package a slide-on protective cover. 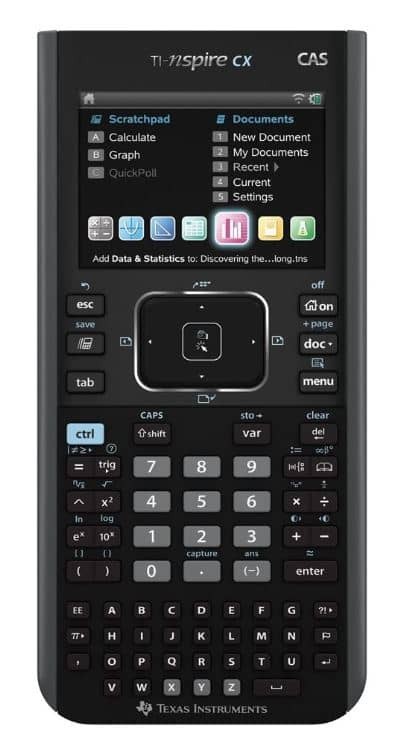 If you want to take this calculator on a test, you can rest easy because the Prime v2 is College Board-approved to be taken on many subject tests in mathematics or IB diploma programme examinations. Hardware-wise, the LA Prime v2 is extremely capable graphically but HP did a great job in terms of software too. The integrated tool suite is quite impressive and includes the HP Equation Writer and the HP Solve application. The former supports lots of linear and non-linear equation solving and the latter is a real time-saver as it enables you to store equations while also solve for variables. The HP G8X92AA LA Prime v2 is one of the calculators with the most advanced graphical abilities that money can buy. Getting the hang of one of these will pretty much guarantee you will easily pass all of your difficult tests. The familiar HP keypad coupled with the 3.5-inch multi-touch display create a premium calculating experience and the integrated tool suite will significantly simplify your understanding process of tough subjects. With many innovative features and supporting a decent range of teaching strategies, the TI-Nspire CX from Texas Instruments is the ideal tool for boosting the understanding of complex mathematics and scientific subjects. This device represents a nice value bundle as it comes in a thin design with a color screen and a rechargeable battery, everything for a reasonable price. Adequate for math and science curriculum requirements from middle school through college, this is a robust handheld tool for enhancing the learning process. An interesting feature is the ability to make real-world connections by importing digital images. You can have your own photos and then easily overlay graphs and equations on them to better visualize how math and science concepts work in the physical world. The TI-Nspire CX has integrated mathematic templates for students to enter expressions and to better look at the math symbols and formulas, just like they’re printed in textbooks or written on the board. Thanks to the unique Chem Box feature, students are also able to introduce chemical formulas and equations. What’s great about this calculator is the navigational approach that Texas Instruments used for it. Intuitive drop-down menus guide the user through the many functions of the calculator. Creating documents and pages can be done comfortably as well as saving your work. If you want to take it with you on the test, there is only good news. Plenty of high-stakes exams accept it as well as certain state exams. This graphical calculator is equipped with a rechargeable battery which eliminates the need to constantly have to replace ordinary alkaline batteries. One of the best graphing calculators around, the Texas Instruments TI-Nspire CX performs flawlessly and does everything it’s supposed to do. The fast calculations are displayed on a responsive screen and the buttons are very intuitively arranged to be more easily found. All in all, this device is strongly recommended if you need a reliable graphing calculator for your classes. A top of the line graphing calculator doesn’t always have to be overly expensive. The Casio fx-9860GII is fully loaded with powerful features and won’t make a dent in your budget. To make every visual aspect clear, Casio integrated a crisp and clear high-res display and to simplify the sharing of programs and data, the calculator is equipped with a USB cable and a unit-to-unit cable. The Casio fx-9860GII features a very crisp LCD screen which displays a sharper high-resolution image of graphs, formulas, and graphics. It has a backlight function to increase visibility in a wide range of study environments. The nice display is well complemented by the icon-based menu system which makes using the calculator an absolute pleasure as it’s very intuitive. Among the most reliable functionality you can find in this graphing calculator there is Dynamical Graphing, Natural Input, and Natural Display as well as a built-in spreadsheet application. When it comes to processing speed, it doesn’t really stand out but it still manages to be very fast for executing complex calculations and producing graphics quickly. Included in the package there’s a USB cable to connect the unit to a PC and the Program-Link software facilitates high-speed data communication. The software of this Casio calculator was designed with the student’s understanding in mind. It encourages engagement for better grasping of the essential mathematical concepts and not only boring memorization of keys to just ”check” for an answer. This is perhaps one of the reasons that the Casio is such a valuable learning tool. 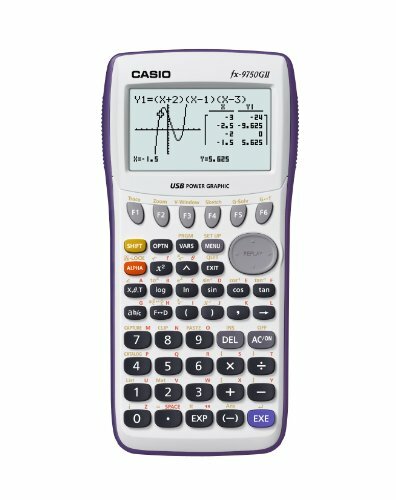 A great calculator for accelerating understanding in the Physics and Math departments, the Casio fx-9860GII offers plenty of ways to go about your homework. Learning all the menu options won’t take long and obtaining better results on your studies is pretty much guaranteed with this useful tool. Considering everything that’s been said about it, this graphing calculator is a solid investment. 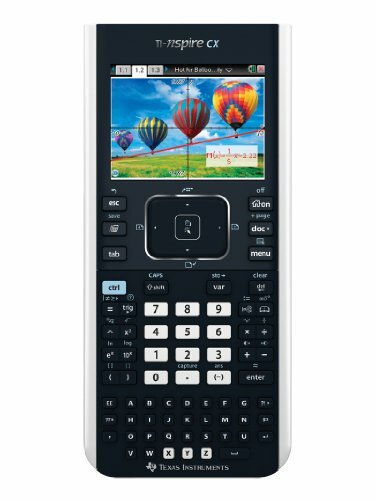 The HP Prime is another interesting choice for a graphing calculator as it offers some quality features for the money. Outfitted in an elegant metal design, it is a great looking device and the performance is even better as the calculator is capable of delivering a very precise calculating experience. This model has been College Board-approved to be used in many tests in Mathematics. The HP Prime has a full-color display which can be controlled using gestures and makes use of a pinch-to-zoom interface. There are so many features that going over all of them is beyond the scope of this review. It’s enough to say that it has lots of applications including CAS, Dynamic Geometry and Advanced Graphing. Dedicated buttons for switching between symbolic, numerical, and graphical table views are also provided. HP understands how important it is to make real-world connections when studying more difficult math or physics subjects. That’s why the Prime has the ability to add a personal image or to use one from the included library as a background and then manipulate a function on it and transform to resize. The Prime supports wireless connectivity if you use a special Connectivity Kit to create a STEM ecosystem. The optional Mobile App offers blended learning and has the same features as the calculator for simple switching between them. For increasing productivity, HP equipped this model with a nice rechargeable battery and when you need the calculator charged you can use the USB connection from a PC besides the standard AC wall plug. As a tool for a student, it is extremely valuable due to its fast graphing abilities, backlit color touch-screen display, and the built-in apps for Spreadsheet and Statistics among many others. There are many advantages if you choose the HP Prime if we also count the large storage capacity and RAM as well as rechargeable battery and RPN entry. A very recommended option, all things considered. The PRIZM is Casio’s revolutionary series of graphing calculators which brings many innovative features to the table. For those wishing to see math in full color, it is an excellent choice. Besides the pleasant screen, this unit is capable of solving lots of complex problems with ease. The attractive package is completed by a big keypad, the different graph colors and many other interesting aspects. The keypad of the FX-CG10 is very large and helps a lot to keep a fluid input of numbers and variables and works great for avoiding typos. If you graph multiple equations at the same time, the different graph colors allow for better distinguishing. A color display has been added for this Casio PRIZM and although it promises a sharp and crisp viewing experience, the pictures might appear grainy sometimes. It’s not the strongest point of it but it’s still decent overall. There are many apps integrated into this graphing calculator and one of them is especially useful and it’s called eActivity. With it, you can input your own notes while simultaneously solving equations. 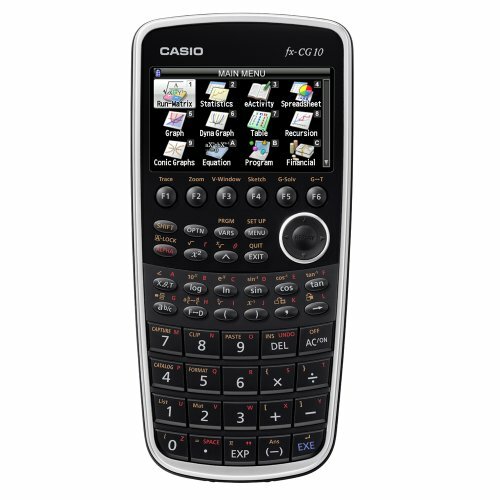 Casio provides a USB connection for linking the calculator with a PC or exchanging data with other units. The removable batteries are powering this device and they can keep the calculator running for a long time. As always, Casio’s intuitive user interface makes using this graphing calculator a pleasant experience. All the classroom functionality is great for students and teachers alike. Coupled with the software design which promotes a firm grasp of mathematical concepts, the hardware side of it is also focused on a simpler navigation and hassle-free learning. If you crave a similar level of computing power like the Texas Instruments Nspire series but without the complicated interface, the FX-CG10 from Casio is an ideal solution for a graphing calculator. The price is more balanced too for such an advanced device. In fact, I’d say that just for the speedy processor alone, this calculator is worth it. But the flexible user interface, the intuitive explanations, and the amazing pre-loaded apps really seal the deal. If you want a top of the line graphing calculator to serve as your efficient mathematics problem solver tool, the Texas Instruments TI-Nspire CX CAS would be a very smart investment. It offers algebraic capability for solving equations symbolically as well as to factor and expand variable expressions and many other powerful calculations. From middle school through college, it is a solid graphing calculator. With a powerful calculator like this one, you can perform various computations and enter with the proper math notation stuff like equations, formulas, and expressions. For geometry, you can construct and explore figures as well as make certain animations. Plotting graphs is easy with the Nspire CX CAS. You can explore many functions and equations or animate points on objects. The Vernier DataQuest application is useful for graphically creating a hypothesis and then replay data collection experiments. For data and statistics, the calculator gives you the ability to summarize and analyze data with many kinds of graphical methods including histograms, bar and pie charts or box plots. Another useful function of the Nspire is the way you can enter notes, steps, and instructions conveniently on the screen next to the math. In lists and spreadsheet, you can perform mathematical operations on your data and better visualize the connections with the plots. The multiple representations of expressions in problems are simultaneously displayed so the students can grasp the concepts visually more easily. If you can get used to the rather clunky UI, you can’t go wrong with the TI-Nspire CX CAS from Texas Instruments. When it comes to graphing calculators, few can match its capabilities. Admittedly, the price is a bit higher than other models on this list but considering the quality and performance, it’s well worth the investment. Adding great value to your learning process, this is a highly recommended tool.